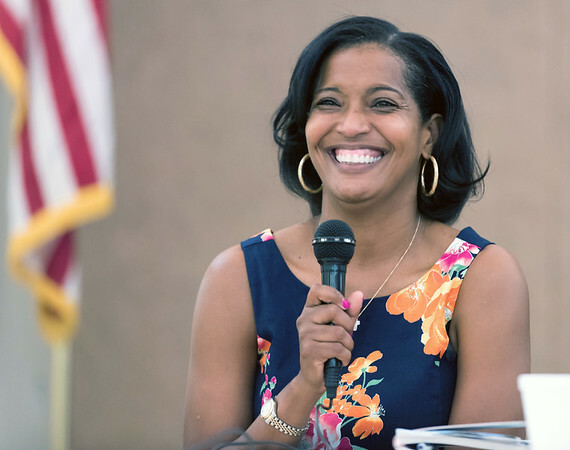 WATERBURY – Democrat Jahana Hayes made history Tuesday night as the former National Teacher of the Year was elected Connecticut’s first black woman to serve in Congress. 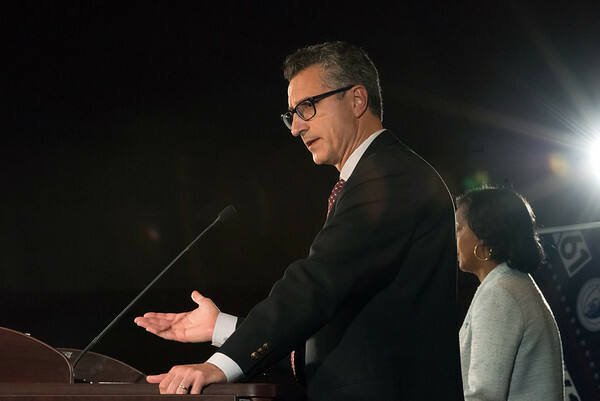 In Connecticut’s only open congressional contest this year, 45 year-old Hayes was competing with Republican Manny Santos to represent the 5th Congressional District in the U.S. House of Representatives. While the Associated Press hadn’t called the race yet, Hayes declared victory shortly after 10:45 p.m.
With tears in her eyes, Hayes thanked supporters and her team Tuesday night for supporting her campaign. Hayes secured 149,445 votes in the district to Santos’ 118,236. Specifically in New Britain, Hayes took 12,028 votes while Santos had 4,383 votes from city voters. Hayes and Santos, a former mayor of Meriden, differentiated themselves from each other often during their campaigns. They debated four times and differed sharply on issues including the environment, college debt and the national economy. A former teacher who still works in the Waterbury school district, Hayes was encouraged to run for Congress by U.S. Sen. Chris Murphy. Hayes narrowly lost the Democratic endorsement to former Simsbury First Selectman Mary Glassman in May, but handily beat Glassman in August’s primary election. The candidate was a teenage mother who grew up poor before working her way through college and earning several degrees. A first-time politician, Hayes fits the profile of a political outsider in what many have called the year of outsider candidates. Conversely, Santos has often aligned himself with President Donald Trump. He has said he’s in favor of most policies enacted by the Republican-controlled Congress during the first two years of Trump’s administration, notably the Tax Cuts and Jobs Act of 2017. The 5th Congressional District is typically considered Connecticut’s most competitive district. While it usually votes Democratic in presidential elections, the 5th District has recently voted for Republicans for governor. Before Murphy won the seat in 2006, Republican Nancy Johnson had represented the district for more than 20 years. Incumbent Democrat Elizabeth Esty announced she wouldn’t seek re-election in April after news broke that she had not acted quickly after discovering that her former chief of staff had harassed a co-worker in her office. Posted in New Britain Herald, Candidates on Wednesday, 7 November 2018 12:19. Updated: Wednesday, 7 November 2018 12:21.